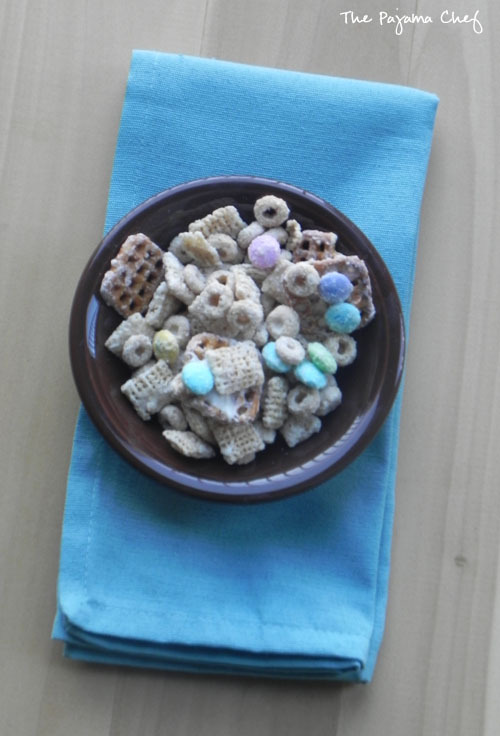 I feel so lame calling this snack mix “Bunny Bait.” What I REALLY want to call it, despite those springtime Easter M&Ms, is Ho Ho Ho Cheerio Mix. Because that’s its real name [for Christmastime]. My mom was given this recipe back in the day with her friend Kim, and it’s been a family favorite ever since. The sweet and salty snack mix is super addictive, so I don’t suggest making a batch unless you have lots of friends and family to share with. Though I want to tell you that the ingredients in this snack mix–Crispix, Cheerios, pretzels, peanuts, and M&Ms are sacred, they really aren’t. Case in point: when I was shopping for ingredients to make this batch, I accidentally grabbed Chex cereal instead of Crispix. I don’t know what I was thinking! But it worked just fine. So feel free to substitute ingredients with what ya got or what you want to use. Cause really, when you pair M&Ms with crunchy cereal and salty pretzels and peanuts [that I left out this time because this batch was a gift for student workers in the library, and I wanted to be sensitive to possible peanut allergies], and top everything with white chocolate, you can’t go wrong. 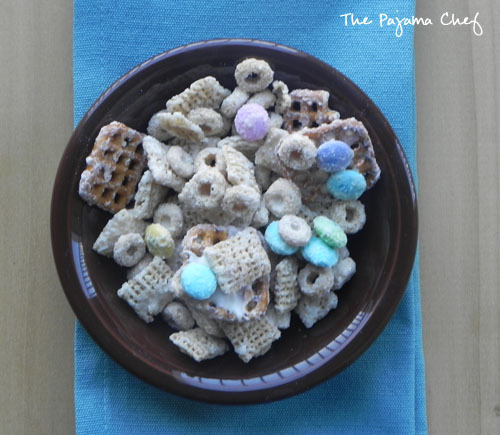 This Bunny Bait or Ho Ho Ho Cheerio Mix or White Chocolate Snack Mix is just divine. It’s perfect for Easter or any holiday, just use the seasonal M&Ms to make it extra festive. Enjoy! 🙂 Happy Easter! In the largest bowl or roaster you own, stir together cereals, pretzels, peanuts, and M&Ms. Then melt white chocolate chips or candy coating in the microwave, heating in 30 second bursts and stirring well in between until melted. This usually takes me about 90 seconds. Stir oil into white chocolate to help with pouring if you like, then pour white chocolate over cereal mix. Stir together to coat, then spread on wax paper to set. Thank you Sarah and Happy Easter to you and your family! LOL I’ve heard it called “White Trash” which I happen to love. We call it “White Christmas Mix” at Christmas time! So yummy.